How can a sweet, cuddly newborn come with so many unknowns? As a new parent, I quickly realized my new mom gig was going to be much harder than I originally anticipated. I had questions. Tons of questions. New questions would surface virtually every minute in those first few weeks. Over time, as I slowly got the hang of taking care of a newborn, the questions lessened. Minus those days, of course, that would cause me to question what I knew about motherhood entirely. Now, nearly a year and half after I laid eyes on my daughter for the first time, I finally feel like I know what I’m doing… for now, at least. And so, from one mother to another, here are the best hacks for first time parents. Everything you need to know to get as much sleep as you can with a newborn. I was so skeptical of swaddling my baby because I was worried about her getting loose and the blanket getting trapped over her mouth. After doing a lot of research, I learned swaddling not only helps babies feel like they’re back in the womb, but it also lowers the risk of SIDS. My daughter slept amazingly when she was swaddled. I also recommend the swaddle sleep sack once your baby is able to break free from their swaddle. The baby shusher is a miracle worker in the baby sleep department. I wish I would have had this item from day 1, but I’m so glad I found it when I did. The baby shusher works to mimic the sounds from the womb to soothe babies to sleep. It works on a timer, too, so if you’re sharing a room with baby it will shut off by the time they fall asleep. I used the baby shusher until my daughter was about 4 months and then we started using the white noise machine, that we’re still using to this day. I’m able to vacuum right outside her room with the white noise machine, so it’s safe to say it’s been an amazing thing to have. I’m sure I’ll probably get some flak for this, but taking away the paci really helped my daughter sleep. At about 4 months she hit the dreaded sleep regression and would fall asleep with her paci then wake up every one to two hours crying for me to come put it back in. I played along with this little game for two weeks before I just couldn’t do it anymore– I wasn’t sleeping, she wasn’t sleeping, and it just wasn’t the best. It took one night of me having to go in and soothe her, sans paci, for her to get over it. She now goes to sleep like a champ! As soon as your doc gives you the go ahead to let baby sleep through the night make sure you’re using overnight diapers. I’ve tried several brands, but the ones I really like the best are Huggies Overnights. Whether or not you’re putting your baby to sleep in their crib or a bassinet next to your bed, make sure the their sheets are very tight fitting and that the environment is free of clutter. This means no blanket, stuffed animals, or toys. The AAP recommends putting baby to sleep in crib or bassinet free from any other items until baby is one year of age. Newborn babies sleep a lot. So if you get in the habit of hushing everyone and tip-toeing around while baby is sleeping, not only will you spend the first few months of baby’s life in silence, but you’ll also train your baby that in order to sleep, things must be completely quiet. While this might not be too hard to pull off the first couple weeks, soon you’ll need to actually get off the couch and get stuff done while baby naps. Newborns don’t have the ability to regulate their temperature like adults and an environment that’s too cold or too warm is dangerous. At most, it’s recommended to dress your newborn in only one additional layer than you. When in doubt about the temperature at night as baby sleeps, it’s safer for baby to be too cold rather than too warm. A thin layer under a breathable (cotton or any other natural fibers) sleep sack is a great solution to keeping baby comfortable at night. Still having trouble getting baby to fall asleep and stay asleep? I cannot recommend this book enough. 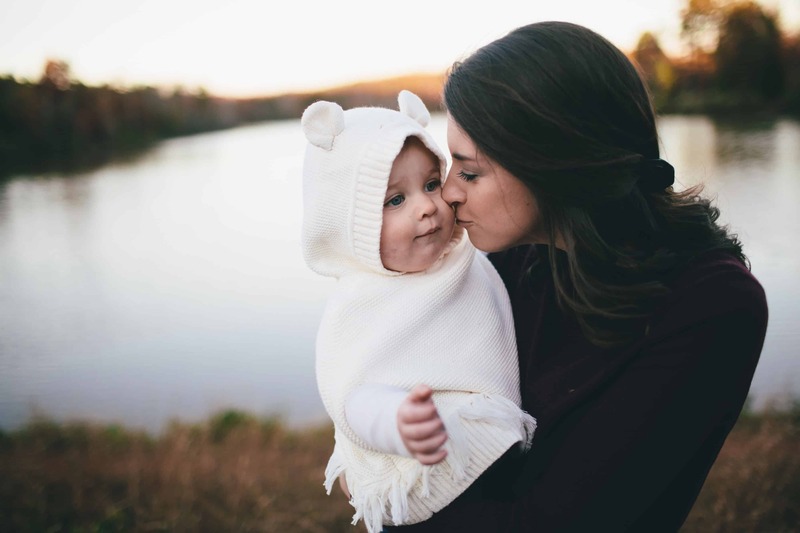 It completely changed everything I thought I knew about baby sleep and the methods I learned help me survive each and every sleep regression with our daughter. Get a diaper, clothes to dress baby in and a towel ready to go before you put baby in bath. Keep one arm under baby’s neck to support baby’s head during bath. Newborn babies are very slippery! For the easiest way to bathe baby during those first couple months, I used this baby bath and placed on my kitchen island, this way I wasn’t bending over. Don’t wash baby’s hair more than once or twice a week to prevent their scalp from drying out. Use a haaka while breastfeeding to collect milk from the side baby isn’t eating on. You can easily work on building a freezer stash with virtually no effort using a haaka. I used to collect 1-2 ounces each feeding session, which really adds up! Nursing bras and nursing tanks are your friends. I lived in nursing tanks during my maternity leave and they were so convenient. Try the hair band trick. Put a hair band around the wrist that your baby ended the last feeding session on. That way, you’ll know which side to start your next feed on. To build a freezer stash lay bags of pumped milk flat. Storing bags in an empty 12 pack soda cardboard container upright also helps to save room. DIY your own pumping bra by cutting holes in to an old sports bra. Try different breastfeeding positions. The football position often works best for newborns who are struggling to latch. This is also a great breastfeeding position for mamas who are recovering from a c-section. Throw out the schedule. Forget about letting the clock dictate when your baby should eat and focus on picking up on baby’s hunger signs and allowing baby to eat on demand. This also helps to maintain your milk supply. Don’t let baby sleep through feedings during the first couple of weeks while you’re trying to establish your milk supply. Once your supply is established and you get the okay from your pediatrician, let that baby sleep, though! The baby industry does a great job at making a product to solve first-time parents every problem, and if you fail bait to their marketing ploys you end up having gadgets over-powering your house. Skip the bottle warmer and heat a bottle by running it under hot water. You can even fill up a glass with hot water and stick the bottle in the glass for a few minutes before you feed baby. Allowing Dad the opportunity to give baby a bottle early on means baby won’t only associate you with feedings. Now you’re freed up to run to the store or do really fun things like sleep more than two hours at a time! Don’t let mom guilt con you into thinking that each bottle must be sterilized after every use. Go ahead and sterilize things you bring home from the store, but after that, pop them in the dishwasher and get some rest. Put small parts in the basket and make sure to only put the bottles on the top rack. At any given point in time, your baby will have dry, rough or irritated skin. Do yourself a favor and buy Aquaphor now. It works wonders. I bought one tube during my daughter’s first month and am still using it. Dry skin, check. Redness or irritation, check. Trust me, this is one item you need in your medicine cabinet. Does baby need to be changed? Newborns sleep a lot and can easily get overwhelmed with too much stimulation. A nap might do the trick. Does my baby have gas? Gas can often be a huge issue for little tummies with an immature digestive system. Guess what? Newborns get bored, too! Playing music, taking baby on a “tour” around the house, going on a walk or reading a book will often change your baby’s mood. Related reading: How to get rid of baby gas, fast! I completely underestimated the magical powers of swaddling until I was completely desperate to help my fussy little girl calm down. I learned to swaddle and the rest was history. Babies love to be swaddled because it reminds them of the womb, so it’s no surprise that it works well to calm a fussy baby. Got an exercise ball collecting dust somewhere? Break it out. Babies love to be bounced. I found bouncing and swaying with our daughter worked even better than rocking. Like clockwork every night around 5 p.m. Emma would decide she was just done for the day. She was fussy, over-tired and all out ornery. One night I broke up the baby carrier and she immediately transformed into a happy, cheerful baby. This trick worked until she outgrew the “witching hour” at around 5 months. Looking for something to soothe a teething baby? Make breastmilk or formula popsicles! These popsicle molds are specifically made for baby’s mouth and are so easy for babies to grasp. You can also make breastmilk or forumla ice cubes and place the cubes into mesh baby feeders, too. Chamomile works wonders to comfort a teething baby. Soak a rag in chamomile tea and toss in the fridge to chill. Once it’s chilled take it out and let baby gnaw on it. Unless baby’s room is close to your main living quarters, you’ll want to add an additional diaper changing station that can easily be accessed so you won’t be climbing up stairs every five minutes. Stash a portable baby changing mat, diapers, wipes and diaper rash cream on the main floor of your home for easy diaper changes. Avoid accidents by placing fresh diaper under baby before you remove the dirty one. It took me exactly one time of not doing this before I vowed never to do that again. Save room in your diaper pail by rolling up diapers and wipes in ball. Starting rolling on the end that doesn’t have the sticky tabs and once diaper is rolled up completely, secure diaper by securing sticky ends around the front. A pretty changing pad cover that matches the theme of your baby’s room is all well and good until you have to change your first poopy diaper. Just say no to a changing pad cover and instead look for a changing pad that looks good sans cover. You could wind up changing your cover 2-4 times or more each day as babies tend to have multiple poopy diapers every day. There will be blowouts, just plan on it. You can preserve the life of your baby’s outfit by promptly rinsing out the garment. Try using Dawn dish soap for stains that are hard to get out. Baking soda works really well to relieve diaper rash irritation because it balances out the pH levels. Run a warm bath and add two tablespoons of baking soda and let baby soak for about 10-15 minutes. Use a few drops of breast milk to quickly clear up a diaper rash. Use an oatmeal bath solution you can buy at the store or just opt for throwing a tablespoon into a warm bath to soothe diaper rash. After running through a bazillion diaper rash creams, I finally found Triple Paste. This cream is the best and seems to instantly take the uncomfortable sting away that comes with diaper rashes. Have a hack I missed? 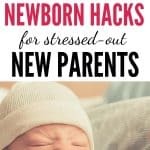 Comment below, I’d love to learn more parenting hacks! Hi there! I tried the link to the baby shusher but it takes me to the swaddle sleep sack. Could you share the correct link for the shusher you used? Thank you!